Definition: A Holistic Marketing approach states that business is considered as a whole wherein all the departments viz. R&D, Marketing, Finance, HR, etc. are integrated and work collectively towards the marketing and sale of a product. This approach has recently gained popularity because of the increased competition in the market where everyone is trying to create the brand image in the minds of the customers. Holistic marketing is based on 360-degree view approach, where ideas and suggestions from everyone who are directly or indirectly related to the business are taken to match up with the changing marketing trends. This approach has given equal importance to every department which can contribute to the success of the product. Generally, the research teams from R&D department check the performance of the product and seek suggestions from the sales person to bring about a positive change in the product. In doing so, the finance department is regularly consulted for the approval of the budget. The type of person required for sale or marketing operations is informed to the HR department whose responsibility is to recruit the suitable candidate. So here the holistic approach is followed where everyone is working together to create a brand image in the minds of the customers and compete with the other brands in the market. Relationship Marketing– Relationship marketing focuses on building a strong and long-lasting relationship with all who can directly or indirectly add to the success of an organization. The major parties in business can be its shareholders, employees, channel partners, customers and financial institutions. Thus, relationship marketing witnesses a strong bond between these parties by understanding their needs, desires and goals. This is the most essential character of holistic marketing that results in a “marketing network” that shows how well all the stakeholders have created mutually profitable business relationships. This marketing network will then decide the position of your business in the market; stronger the network higher will be its position in the market. Integrated Marketing– Integrated marketing means how well the 4 P’s of the marketing mix (product, price, place, promotion) are synced to deliver the efficient message to the prospective customers. What so ever communication tool viz. Television, radio, public relations, print advertising, m-commerce, email, etc. is chosen by the marketer he must ensure that every tool contributes its maximum in increasing the efficiency of the message.Integrated marketing, an important character of holistic marketing must ensure that each communication tool must give a real and authentic information to the customer. Internal Marketing– Internal marketing means hiring, training, motivating and inculcating business values in able employees who can serve customers well.This approach is based on a general understanding that if employees do not have full information about the product then how can we expect them to convince the customers to purchase it.Thus, internal marketing is an important holistic marketing trait that is prevalent at all the levels of the organization. It enables to know the understanding level of the product among the employees and thereby imparting the necessary training to meet the expected results. Also, sometimes an employee do not feel good about his day to day work or is not satisfied with the work. Then the same can be found out through this approach, and some level of motivation and training can be given to overcome this situation. Performance Marketing– Performance marketing focuses on the returns to the business from the marketing activities undertaken as well as the effects of the same on the society as a whole. The marketer has to give answers to the top authority for the amount spent on marketing activities along with its effects on business. Also, every business has some responsibility towards the society in terms of legal, ethical and social context. Being a crucial holistic marketing trait, every marketer must ensure that activities undertaken by him to promote the product does not harm the sentiments of customers and should be real in every sense. 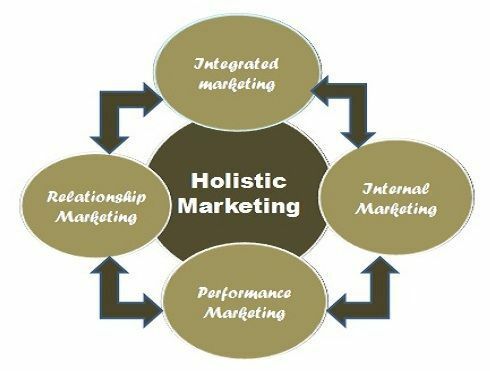 All the components of holistic marketing show that business works as a single unit wherein all the functional departments work together towards the accomplishment of organizational goal i.e. increasing sales.